Bring the beauty and shimmer of crystal-look glass to your candle lighting ceremony. 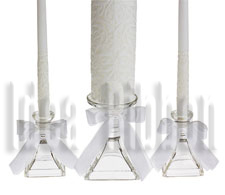 Elegant glass holders make a beautiful display of the unity candle and tapers. 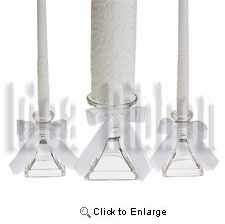 Use them after the ceremony at the reception to light the bridal table. At home, they fit perfectly with any table d��cor��everyday and special occasion. Ribbon trim. Unity candleholder is 5 3/4 in. high; holds a pillar candle up to 3 3/4 in. diameter. Each taper candleholder is 4 1/4 in. high; holds a standard size taper. Candles not included.